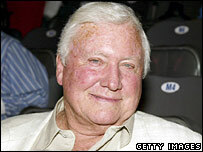 Merv Griffin, the US entertainer who created the game shows Jeopardy and Wheel of Fortune, has died aged 82. He had been diagnosed with prostate cancer earlier this year. 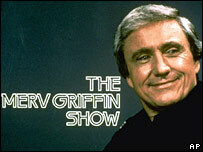 Griffin was known for his self-titled TV series, which ran for more than 5,500 editions in the 23 years to 1986, and had spells as an actor and singer. His son Tony called him "a visionary" who "loved business", saying Griffin was even working on a new game show after entering hospital last month. Jeopardy was first broadcast on US television in 1964, and has since won 27 Daytime Emmy Awards, while Wheel of Fortune made its debut 11 years later. 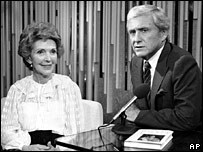 His wife Julann - whom he divorced in 1973 - came up the idea for Jeopardy as "a twist on the usual question-answer format of the quiz shows of the '50s". "Her idea was to give the contestants the answer, and they had to come up with the appropriate question," he wrote in his autobiography. Devising the shows secured his financial future, after he sold the rights to Columbia Pictures and kept a share of the profits. Griffin bought a hotel when he tired of trying to invest his money, having been "so bored" spreading his fortune across bonds and stocks. "I said, 'I'm not going to sit around and clip coupons for the rest of my life,'" he recalled in an interview in 1989. "That's when Barron Hilton said, 'Merv, do you want to buy the Beverly Hilton?' I couldn't believe it." But Griffin did acquire the property for $100m (£49m), and then spent millions more dollars completely refurbishing it. He also bought a company which ran casinos and hotels, telling Life magazine 19 years ago that the "gamesmanship" in such business deals "parallels the game shows I've been involved in". Born on 6 July 1925 in San Francisco, Griffin's first job was as a singer on the radio programme San Francisco Sketchbook. 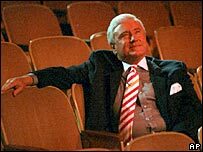 According to his website, within two days the programme was renamed The Merv Griffin Show, and soon afterwards he was earning in excess of $1,000 (£490) a week. He became the featured vocalist in Freddy Martin's big band, before having a hit with a version of novelty song I've Got a Lovely Bunch of Coconuts. Doris Day and her producer husband, Marty Melcher, saw Griffin perform in Las Vegas and recommended Griffin to Warner Bros, which offered him a film contract. He appeared in By the Light of the Silvery Moon with Day and Gordon MacRae, and had a bigger role with Kathryn Grayson in So This is Love. As an actor, he also befriended future US President Ronald Reagan, and was an honorary pallbearer at Reagan's state funeral in 2004. Besides his son Tony, Griffin is survived by his daughter-in-law, Tricia, and two grandchildren. His funeral will be held at The Church of the Good Shepherd in Beverly Hills but the date has yet to be confirmed.